That would explain why people with ALS gradually lose muscle strength, rather than immediately losing the ability to move, Hickman pointed out. It would also explain why potential therapies that reduced the loss of motor neurons in mice did not save the junctions, or the animals (Gould et al., 2006; Rouaux et al., 2007). And, once the neuromuscular junctions (NMJs) begin to crumble, muscle fibers, neurons and glia are likely in trouble too, added Gregorio Valdez of the Virginia Tech Carilion Research Institute in Roanoke. These findings prompted Valdez, Hickman and others to focus their attention at the junction. Their groups are among those developing in vitro models of the NMJ, to better understand its workings and potentially screen for drugs that support these structures. “This is something that’s sort of come back into vogue recently,” said Pierre Drapeau of the Université de Montréal in Canada. “We’re trying to catch things at the beginning.” Drapeau and his collaborators, screening in nematodes, happened upon a drug that seems to stabilize junctions (Patten et al., 2017). This medication, pimozide, is already approved for conditions such as schizophrenia. The researchers are now starting a phase 2b clinical trial. One advantage of strengthening the NMJ is that it seems to collapse in all forms of ALS, noted UCF’s Xiufang (Nadine) Guo. 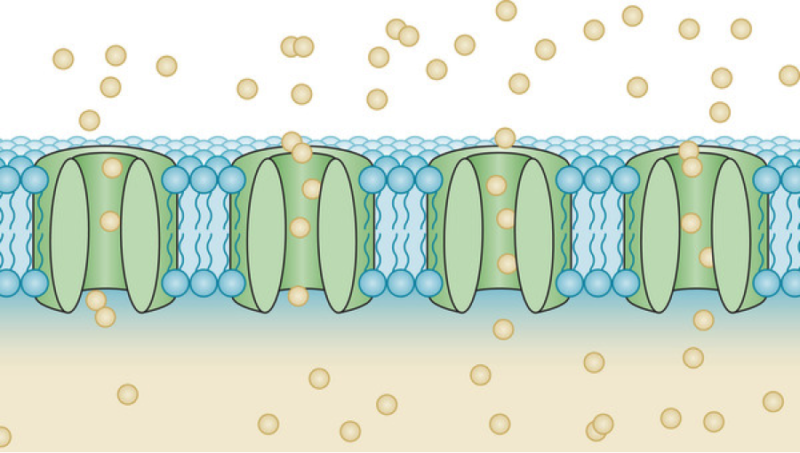 While many scientists are developing treatments that target altered genes (Dec 2017 news), this approach might, potentially, help anyone with ALS, or other conditions where NMJs are affected, such as muscular dystrophy. Drapeau wasn’t specifically looking for a NMJ stabilizer. In the wake of discoveries of TDP-43’s role in ALS (Oct 2006 news; Feb 2008 news), he started making zebrafish carrying human TDP-43 with disease-linked mutations. His colleague Alex Parker did the same with the worm Caenorhabditis elegans. Typically, scientists go after a drug by identifying a specific molecular target, and then seek compounds that affect its function in vitro. But Drapeau and Parker didn’t know what TDP-43 was doing wrong in ALS. So, instead, they screened for small molecules with any benefit to their animals—drugs that would get the paralyzed worms and fish moving again. Parker’s group screened nearly 4,000 small molecules, including clinically approved drugs, in the mutant TDP-43 nematodes. They found 24 compounds that restored mobility. Of those, the researchers considered 11 irrelevant—they were insecticides or other drug types that didn’t seem pertinent to the disease. Nonetheless, he treated his mutant TDP-43 zebrafish overnight with those drugs. Ten hits restored swimming, with pimozide providing the most benefit. “It was quite dramatic,” he said. 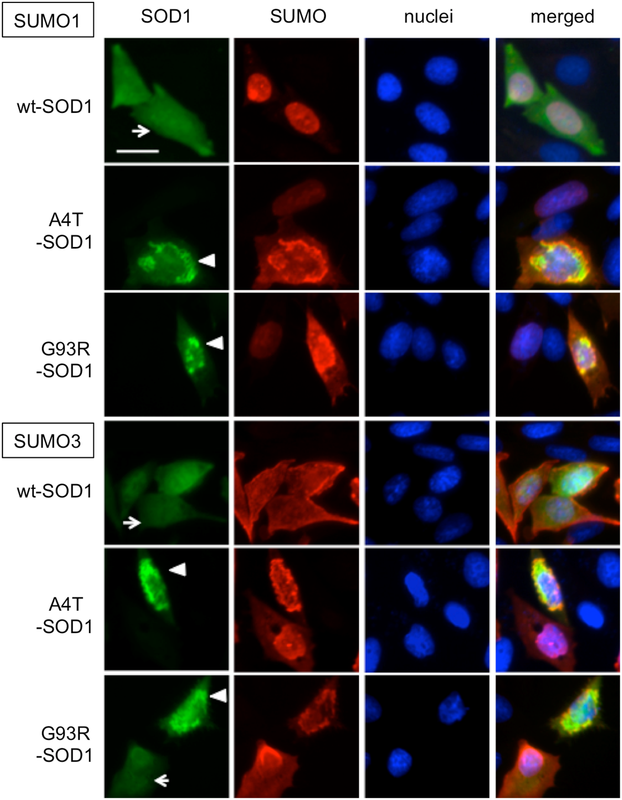 The researchers also tested pimozide on zebrafish models of FUS and SOD1 ALS. Again, it improved the speed, distance, and length of time the fish could swim, suggesting the drug might be of benefit to multiple forms of the disease. The researchers suspected that the drug stabilized the NMJ in the fish by increasing neurotransmission (see Avila et al., 1989). They confirmed that by electrophysological analysis. 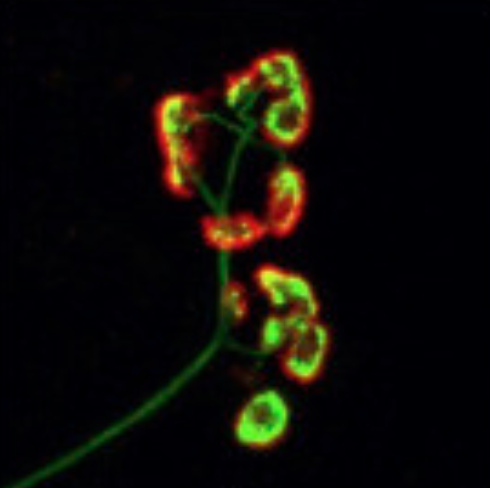 Collaborator Richard Robitaille’s team, also at Université de Montréal, used a similar approach in mutant SOD1 mice. Again, pimozide improved neurotransmission. How did pimozide do this? After all, it’s thought to work by blocking dopamine signaling in the brain. But, it’s no longer used for some conditions due to off-target side effects. Might blocking one of those unintended targets be helping stabilize the NMJs? When Terry Snutch of the University of British Columbia in Vancouver, Canada, heard Drapeau speak about the findings, he offered a clue. His team found that pimozide can partially inhibit certain calcium channels (Santi et al., 2002). In the central nervous system, this enhances neurotransmitter release and strengthens the synapse, explained Robitaille. It’s not yet clear, however, if this happens at the NMJ, he added. Encouraged by the results, the team turned to University of Calgary’s Lawrence Korngut in Canada to conduct a small phase 2, 6-week study to determine whether the approach is safe for people with ALS and could potentially be of benefit. 25 people with ALS participated. Initially, the researchers aimed for a maximum dose of 6-10 milligrams per day, based on the typical dose of pimozide used clinically. However, this turned out to be difficult for people with ALS to tolerate. Korngut lowered the dose to 2-4 milligrams. Even this caused some weakness and restlessness. To assess target engagement at the NMJs, the researchers used electromyography to measure the activity of 3 muscle pairs. Two were on either side of the hand, the third was in the upper back. They noted one significant change, in the right thumb: muscle function declined by less than 5% in participants taking pimozide compared to 5-15% in those taking placebo. The researchers detected no significant difference in the rate of functional decline (ALS-FRS-R) or lung capacity. And, the placebo group progressed faster according to further analysis (Patten et al., 2017). Nonetheless, they took the change in the thumb muscle—one involved in fine motor control, and one of the earliest to degenerate in ALS—as a promising sign. “We were very excited that Lawrence could see anything,” said Parker, “in six weeks.” Now, the researchers are embarking on a larger, double-blind, randomized, placebo-controlled study, with 100 people with ALS treated for up to 22 weeks. Kornegut, however, cautions that there is more work to do before we know whether pimozide may be of benefit to people with ALS. “We must first confirm that it is really useful and safe in the long term,” he said in a statement. “It is also important to be aware that pimozide is associated with significant side effects.” These include dizziness, blurred vision, and tremors. Drapeau and Parker are developing pimozide derivatives that might have more focused activity, hoping to eliminate some of these unwanted side effects. Parker is delighted to see a project that started in nematodes reach the clinical-trial stage. But these worms, after all, are not human, and lack human NMJs. In fact, he recalled, some scientists told the researchers they were crazy to base a trial on these small-animal models. 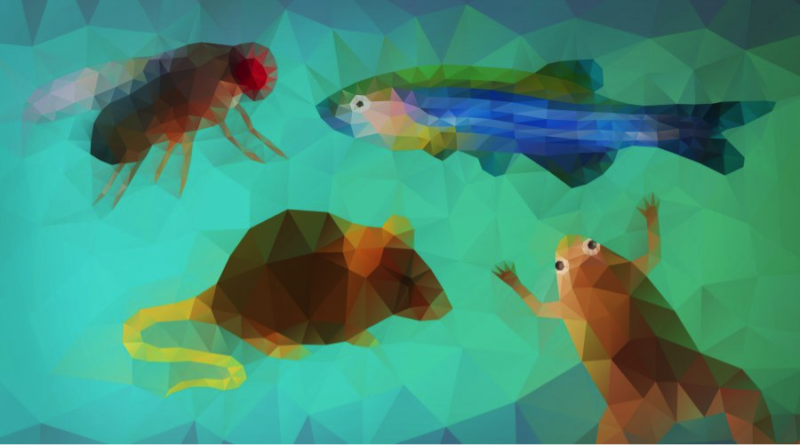 There are certainly differences between species; a recent analysis reported that human NMJs are smaller, simpler, and more fragmented than those of rodents, yet remain stable over longer periods—indeed, they last the entire lifespan, while those of rodents degenerate in just a couple of years. Key NMJ proteins are also differentially expressed, with some at higher levels in people, and some higher in mice (Jones et al., 2017). Overall, though, the NMJs of vertebrates are “pretty similar,” said Steve Burden of the New York University Medical School. An alternative approach, taken by Hickman and Guo, is to build human ALS-specific NMJs in a dish and screen for drugs that stabilize them. They microfabricated chips with one side for iPSC-derived motor neurons and one for satellite cell-derived myotubes, with channels between them for axons to grow through. The two cell types connect and form functional NMJs that are able to transmit signals, causing the muscle cells to contract, according to a preliminary analysis presented at presented at ALS/MND 2017 in Boston last December. Now, the team plans to use this system to identify potential therapies for ALS, in collaboration with Hesperos in Orlando, where Hickman is chief scientific officer. Other scientists, too, are creating NMJs in vitro. At ALS/MND 2017, Brian Wainger’s laboratory at Massachusetts General Hospital in Boston presented its own model, also based on human iPSCs. And, Victor Rafuse’s team at Dalhousie University in Canada is building NMJs using mouse neurons and chick muscle cells (meeting abstracts IVT-08-IVT-10). Going in vitro offers many advantages, said Hickman. His group can compare NMJs made with the cells from people with different forms of ALS, including, they plan, sporadic disease. “I think by having a direct human system, working on disease models, gives us a distinct advantage,” Hickman said. 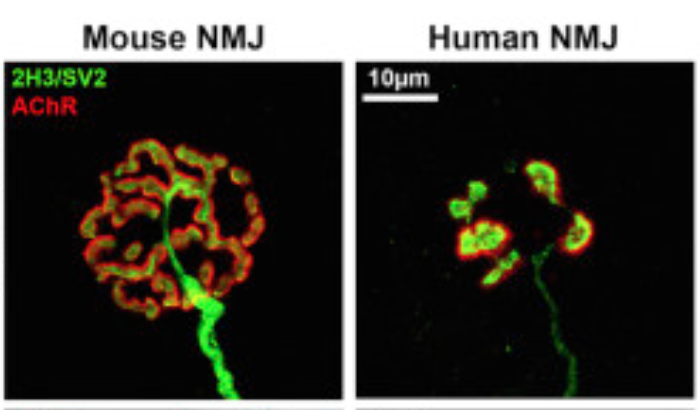 Plus, this approach means Guo can connect disease-linked motor neurons with wild-type myotubes, and vice versa, to determine which cells are key to any NMJ deterioration. She can also apply the drug to only one cell type, to analyze which one benefits. However, in vitro models have their downsides, too. They’re typically missing a crucial player: the perisynaptic Schwann cells that encircle the axons. “For a neuromuscular junction to be stable and function, to maintain and repair, they need perisynaptic Schwann cells,” said Valdez. (Other cell types could be added to NMJs-on-a-chip, Hickman and Guo said.) They also lack the blood supply, satellite cells, immune cells, and other features, Robitaille added. Valdez and Burden pointed out other differences, too. For example, in animals the axon stops growing when it hits a muscle. In a dish, the axon often forms a junction, but keeps on growing past it, said Burden. And, since most in vitro models are only two-dimensional, they fail to replicate the three-dimensional structure of a proper junction, Valdez added. “We’re getting closer, but we’re not there yet,” said Valdez. With further research, he suggested, it should be possible to solve these problems. Burden said that current in vitro NMJs could still be a useful platform to screen for drugs, provided they pass a key test: There must be a clear difference between NMJs formed by wild-type cells and those carrying ALS-linked mutations. “As long as it replicates the detachment…then I’d say you have a good system,” he said. As for Drapeau, he said, “I still believe the whole animal readout is the best.” His collaborator, Justin Ichida at the University of Southern California in Los Angeles, tried pimozide out in their in vitro model and saw no effect. “It might be just be that they’re missing components that are in the animals, that aren’t in the dish,” Drapeau said. Save the NMJs, Enough Said? Scientists are also taking the more traditional, target-directed approach to find molecules that might protect NMJs (Jun 2017 news). Burden is hoping to bolster NMJs by boosting the activity of MuSK, a key enzyme that helps make these muscle-motor neuron connections. Increasing MuSK activity in ALS model mice delayed the start of muscle denervation by about 10 days, and decreased its extent for more than 40 days, enhancing muscle strength (Pérez-Garcia and Burden, 2012). Now, Burden’s team is developing a therapy using a similar strategy, by testing antibodies, developed by Genentech, that activate MuSK in these mice. Meanwhile, Tivorsan Pharamceuticals in Providence, Rhode Island is testing biglycan, a small protein found in muscle extracellular matrix, as a potential treatment for ALS at the preclinical stage (Jun 2017 news). It plays a role in stabilizing the NMJ, likely by helping activate MuSK and regulating its density at the motor nerve terminals (Amenta et al., 2011). 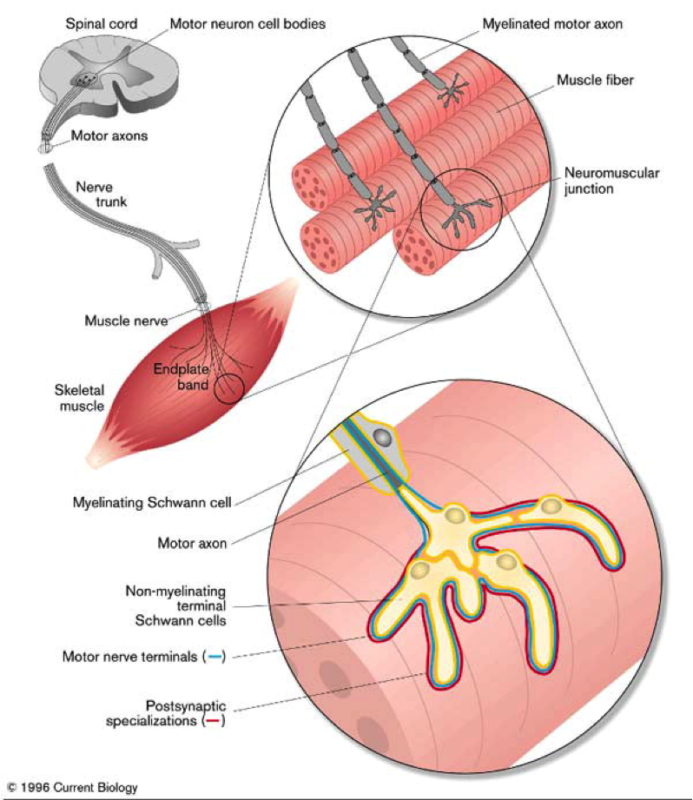 Should one of these approaches keep muscles and motor neurons connected, what effects could they expect in people with ALS? “I’m not sure stabilizing NMJs would be sufficient, on its own, to ‘fix’ ALS, but it sure would help,” said Robitaille. Their muscles might stay stronger longer, he suggested. What about survival? Increasing MuSK activity increased survival of ALS SOD1 model mice at most moderately (July 2017 news; Miyoshi et al., 2017). It’s not clear if preserving junctions would be enough. “Even if you only kept the synapses attached longer, that would in and of itself be a huge benefit, that’s my feeling,” said Burden. The pimozide trial may offer some answers, but one thing is for certain: the NMJ is getting some much-deserved attention. Colón A, Guo X, Akanda N, Cai Y, Hickman JJ. Functional analysis of human intrafusal fiber innervation by human γ-motoneurons. Sci Rep. 2017 Dec 8;7(1):17202. [PubMed]. 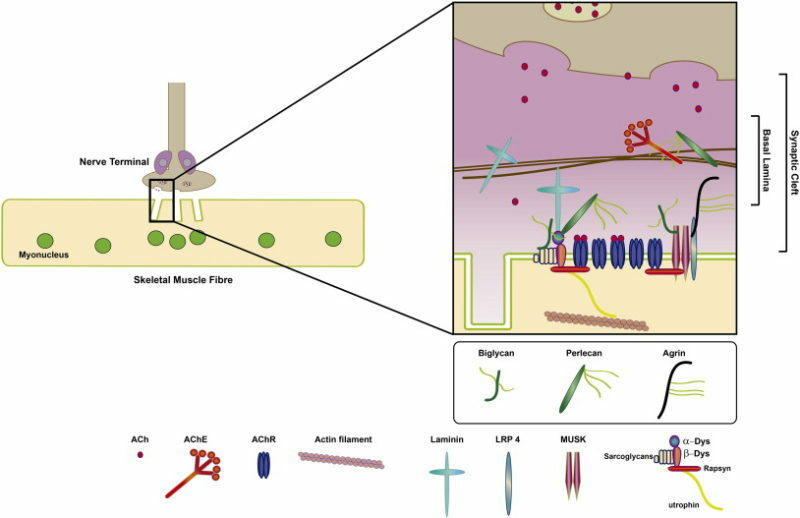 Arbour D, Vande Velde C, Robitaille R. New perspectives on amyotrophic lateral sclerosis: the role of glial cells at the neuromuscular junction. J Physiol. 2017 Feb 1;595(3):647-661. [PubMed]. Thomson SR, Wishart TM, Patani R, Chandran S, Gillingwater TH. Using induced pluripotent stem cells (iPSC) to model human neuromuscular connectivity: promise or reality? J Anat. 2012 Feb;220(2):122-30. [PubMed]. For people with ALS and their families, learn more about pimozide by checking out this recent ALS Canada talk presented by University of Calgary neurologist Lawrence Kornegut and the ALS Association blog.